A man who risked his life to prevent a car driving into a crowd of people has been presented with a bravery award. Andrew Niinemae, 35, smashed the vehicle's window and tried to pull the handbrake outside a Cardiff bar. 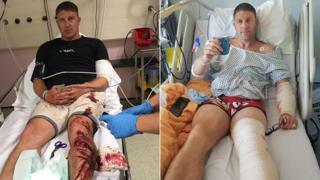 He needed emergency surgery after suffering severe injuries but insists he does not see himself as a "hero". However he is among nine people - including cycling champion Geraint Thomas - to receive a St David Award at a ceremony at the Senedd in Cardiff. Mr Niinemae intervened when a car was driven towards a group of about 20 people outside a bar in the Whitchurch area of the city last June. Witnesses said the father-of-three "saved lives" by smashing the car's window and attempting to pull the handbrake. "I don't regard myself as a hero because I didn't think about what I was doing," he said. "Everything happened so quickly that I just acted on instinct. My wife wasn't too happy that I put myself in that situation." Mr Niinemae was off work for three months as he recovered from his injuries and still has limited feeling in his left leg. One man was arrested at Gatwick airport but no-one has yet been charged in what South Wales Police described as a "shocking incident". "Maybe I was lucky. It's not every day someone is smashed and trapped between two cars and walks away," said Mr Niinemae. "I'd like to think I would do the same again because of how much more serious it could have been. Someone could have died." Eight other people have been presented with awards that recognise the achievements of people in Wales from all walks of life. Among the categories considered are citizenship, innovation, sport and young people. First Minister Mark Drakeford said: "Our winners really are everyday saints - they're the people in our communities who are working for change. "They are the organisations supporting others to achieve their dreams and the people who find themselves in unprecedented situations when they're walking down the street. "Each and every finalist embodies the essence of Wales - they are life-changers." Cardiff Street Pastors: Trained volunteers from 25 churches patrol Cardiff city centre on Friday and Saturday nights to help those in need. Hijinx Theatre Company: A pan-Wales theatre company which casts neuro-diverse and learning disabled actors in its award-winning theatre productions. Hilltop Honey: Selling organic Fairtrade honey, the Newtown business has seen turnover increase to more than £4m since being established in 2011. Cerebra Innovation Centre: Swansea-based charity dedicated to helping families with children with brain conditions discover a better life together. Liam Rahman: From Carmarthenshire, he became director of E-Qual Education and employs more than 100 people in Wales as well as mentoring students to learn more about international opportunities. Geraint Thomas OBE: first Welshman and only the third British cyclist to win the Tour de France. Bethan Owen: A young carer for her mother, she now runs a not-for-profit karate club near Rhyl for other young carers between the ages of six and nine to develop confidence, self-esteem and have a break from their caring responsibilities. Professor Sir Deian Hopkin: The historian advised the Welsh Government on the First World War commemoration project Cymru'n Cofio - Wales Remembers 1914-1918.